One of the fun things about doing research for my blog is that I sometimes find very cool information I never knew before. This bird is one such discovery. 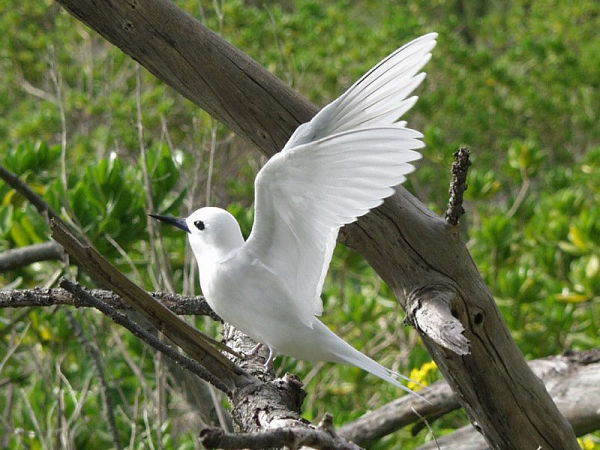 The white tern (Gygis alba) is a pantropical bird with many names and an amazing habit. It’s all white with dark eyes and a thick black bill that’s blue at its base. In flight it’s buoyant and erratic with quick changes in direction and speed. Perhaps this gave it a second name: fairy tern. In Hawaii it’s called Manu-o-ku. White terns eat saltwater fish and nest by the ocean but they never build a nest. The female lays only one egg per clutch in whatever suitable depression she can find. This could be on gravel, rock, or — most amazingly — on a tree branch. Imagine this: an egg sitting all by itself on the branch of a tree. Click here to see what this looks like! If the egg isn’t blown off the tree, it stands a good chance of surviving because it’s in a sneaky place. Both parents incubate, brood and feed the chick and when it’s independent in two months’ time, its mother may lay another egg on the same tree branch and start the process all over again. In this way white terns can raise up to three chicks per year. Their crazy nest site selection must work. White terns are listed as “Least Concern” on the IUCN Red List with over 100,000 breeding pairs worldwide. The white tern is one of my favorite birds. If you run a Google search for images of them, you’ll see some beautiful–and some comical–photos. There’s one of a baby swallowing a fish that has to be as big as he is. I’d like to get a webcam on this ‘nest’!!! What an interesting blog today! Thanks!